I wanted to bake something really quick today. 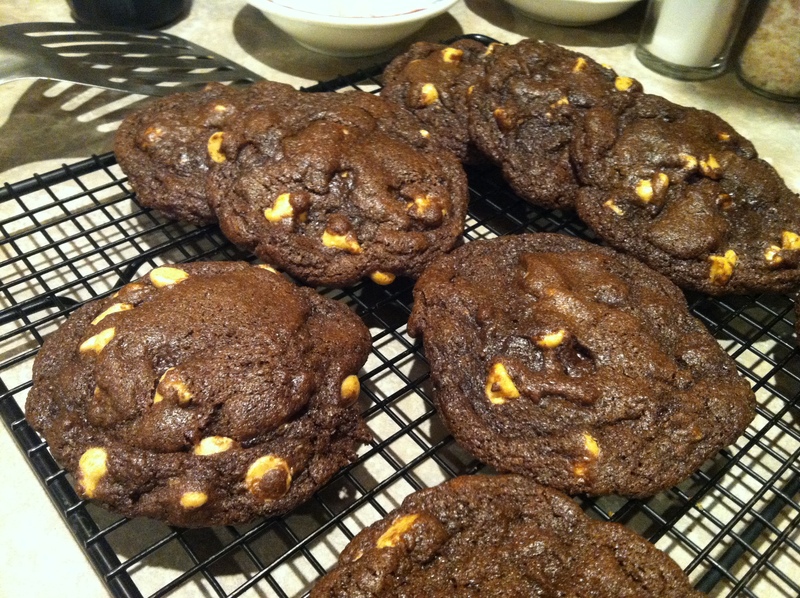 I had some errands to run and wanted to bake something when I got home. Sunday is our dinner day. I must be prepared not only for dinner but for dessert. What would our Sunday be without something sweet! 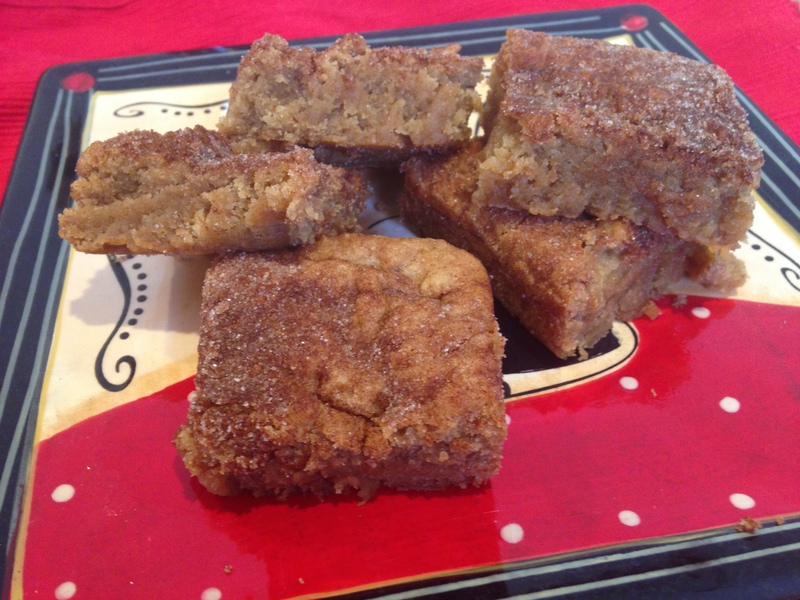 I posted on my facebook I was going to make Snickerdoodle Bars. I had a recipe I was thinking of using. My friend Jill asked if I wanted to use her recipe. Well, why not?! She has one she used from Six Sister’s Stuff blog. I thought I would use it too. I made a couple of small changes. I could’t resist! 😉 This recipe is more than Simple and extremely Delicious!! 3. Spread in a greased 9×13 pan. The batter will be thick almost like a cookie mixture. 4. Combine the cinnamon topping ingredients and sprinkle over the top. 5. Bake at 350 degrees for 25-30 minutes or until top springs back when pressed. Once it cools, it will harden more. This is a very quick recipe and is awesome. You will love it. Enjoy!! 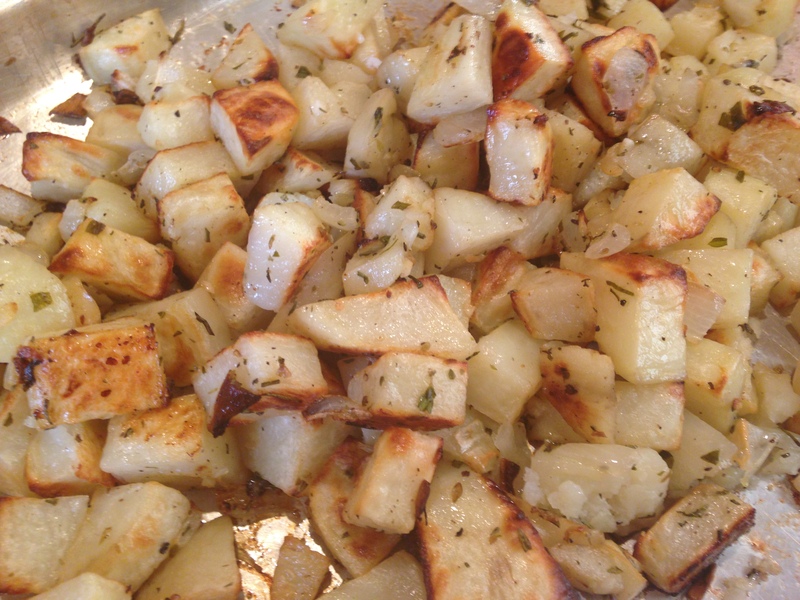 Roasted Potatoes – Simple and Delicious! 03/30/2014; Updated the recipe to these roasted potatoes today. Hope you enjoy them. I know we do!! 2.Put all of the above ingredients in a bowl. Mix together. 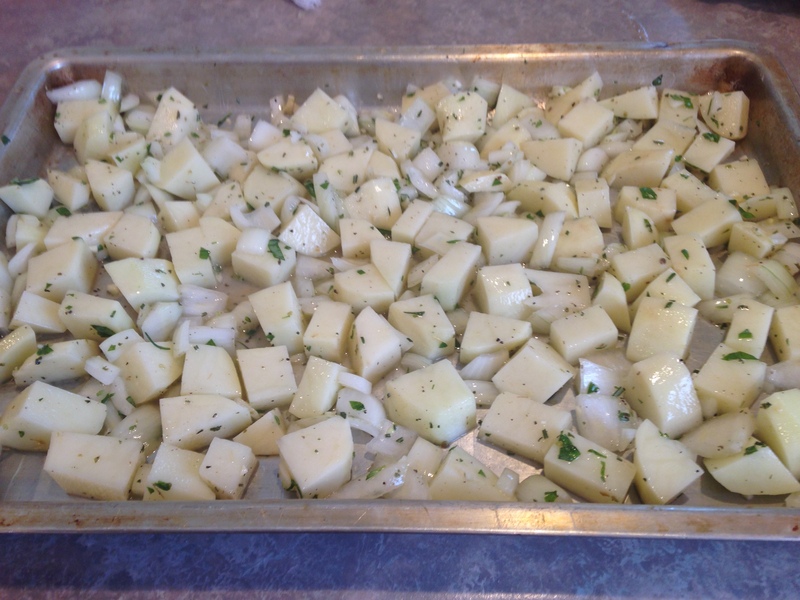 3.Using a flat container (cookie sheet), spread out the potatoes into a single layer. If they are over crowded they will not brown. 4. Roast 30-45 minutes until brown. No longer than 45 minutes! Rachel hates potatoes. She loves these potatoes. Hope you do too! Here is a first world problem that I have been dealing with for about 6 months. Whenever anyone tries to call me on my cell phone it automatically will go into voice mail. In order for me to get the call you would have to immediately call me a second time. I know this because Martin has been dealing with it for 6 months too. He keeps telling me to fix my phone. I am great at procrastinating and telling him I will take care of it (I promise), and then I forget and you know how that goes. I Googled my first world problem to see if anyone else was having the same issue with their iPhone. It appeared other people had the same problems. They were also unable to fix it. That was about as far as I got into attempting to fix my phone. One day Martin2 tried logic on me and said I really need to fix my phone. If there was an emergency and the hospital tried to call me, that person would not know to call me right back. So after that lecture I made an attempt to get my phone fixed. I called Verizon’s customer service. The lady went through all kinds of tests. In the end my phone seemed to work, at least for her, and that was that. I called Martin to have him call me. Well, needless to say it did NOT work. Ugh, I will call back another day. So, weeks go by and Martin is like MOM FIX YOUR PHONE!! His nagging got me to stop into the Verizon store today. I explained my dilemma to the nice Verizon guy. He immediately looks at my phone. He asked me if I noticed the “moon”. I said “Oh yeah, that has been there a long time. I didn’t know why but I just figured it meant it wasn’t anything important.” He smiled and pressed some buttons and said with a smile “It was on Do Not Disturb. That is what the moon means!” HaHaHa, that cracked me up! My mom calls me (with love mind you) ditzy, scatterbrained and an airhead. If I didn’t have to scream into the phone to talk to her I would tell her this story. It would crack her up too!! I guess I will save it for the next time I visit or maybe I will print this out and show her. 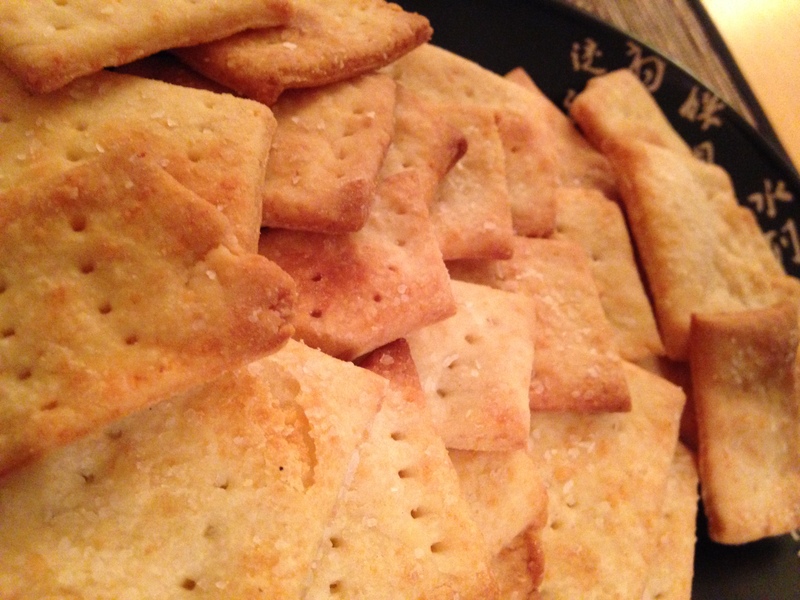 I have been making these crackers for a few years. They are always a hit. They take under 30 minutes to whip up and are extremely simple and delicious! I baked some this morning before I left for work. I brought some to work with some gouda cheese. The rest I gave to Martin. He loves these crackers. I forgot to take a pic!! I am hoping he hasn’t eaten them all yet and sends me a photo to post. If not, next time I make them I will get some photos posted. With or without a pic you should give these a try! 1. In a food processor pulse together flour, salt, cheese and butter. 2. Add cream and mix until dough forms into a ball. If you need more liquid, add more cream a teaspoon at a time. You will not need much more. 4. Roll out dough about 1/4 inch thick. I use a pizza cutter to cut into 2×2 or smaller squares. 5. Poke dough with tines of fork. Sprinkle with kosher salt or whatever you desire. 6. Place on baking sheet lined with parchment paper. 7. Bake at 400 degrees for 10 minutes. I turn the baking sheet around after 5 minutes. This way the crackers brown evenly. 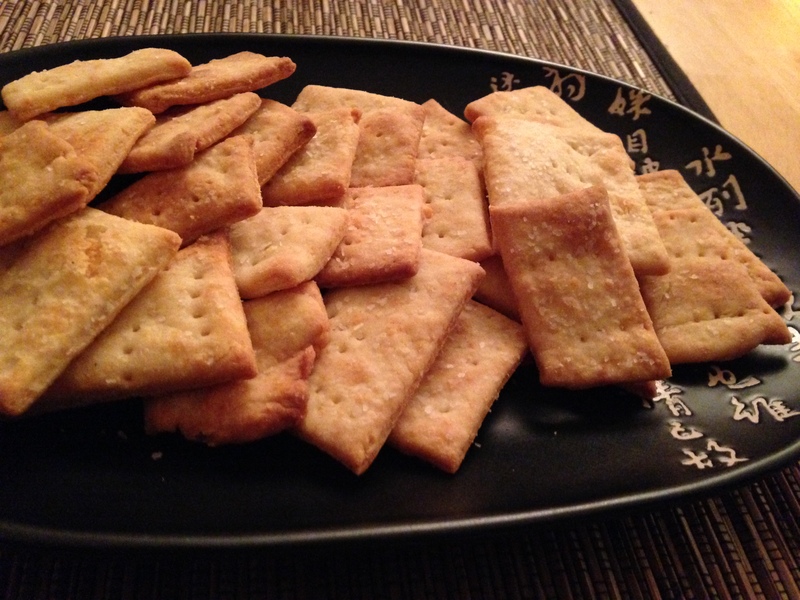 Believe me you will enjoy these crackers with cheese or all by themselves! These are Kent’s favorite cookies. Oh, and everyone else who lives in this house too. As always, Simple and Delicious! 5. Fold in the peanut butter chips. 8. Let cool completely and ENJOY! 3. In bowl of standing mixer, beat butter, sugars, and salt at medium-low speed until sugar is moistened, about 30 seconds. Increase speed to medium-high and beat until mixture is light and fluffy, about 4 minutes, scraping down bowl with rubber spatula halfway through. With mixer running at medium speed, add eggs one at a time, beating well after each addition and scraping down bowl halfway through. Beat in vanilla; increase speed to medium-high and beat until light and fluffy, about 45 seconds. With mixer running at low speed, add chocolate, then increase speed to medium and beat until combined, about 30 seconds, scraping down bowl once (batter may appear broken). With mixer running at low speed, add dry ingredients in 3 additions, alternating with sour cream (in 2 additions), beginning and ending with dry ingredients, and beating in each addition until barely combined. After final flour addition, beat on low until just combined, then stir batter by hand with rubber spatula, scraping bottom and sides of bowl, to ensure that batter is homogenous (batter will be thick). Divide batter evenly between prepared cake pans; spread batter to edges of pans with rubber spatula and smooth surfaces. 4. Bake cakes until toothpick inserted into center of cakes comes out clean, about 30 minutes. Cool in pans 10 minutes, then invert cakes onto greased wire rack; peel off and discard paper rounds. Cool cakes to room temperature before filling, about 1 hour. (Cooled cakes can be wrapped in plastic wrap and stored at room temperature for up to 1 day. TO ASSEMBLE: Stir toasted pecans into chilled filling. Set one cake on serving platter or cardboard round cut slightly smaller than cake, and second cake on work surface (or leave on wire rack). With serrated knife held so that blade is parallel with work surface, use sawing motion to cut each cake into two even layers. 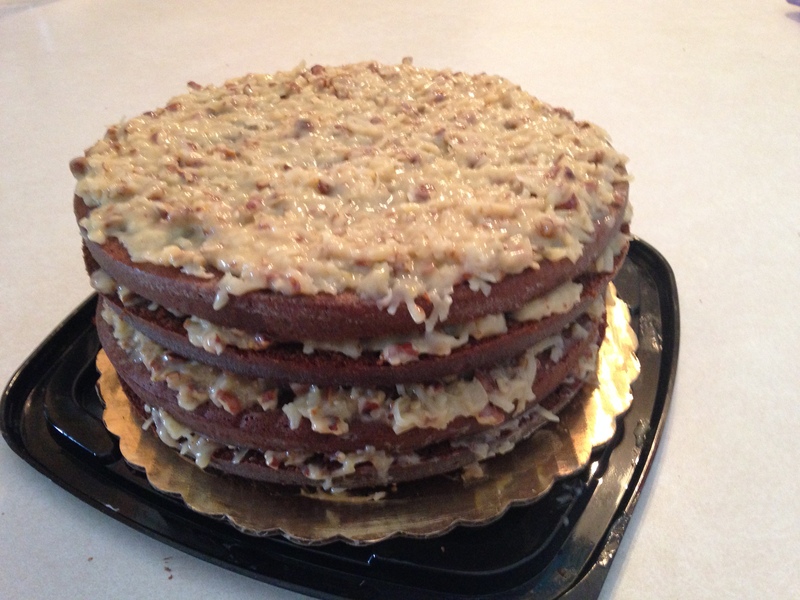 Starting with first cake, carefully lift off top layer and set aside. Using icing spatula, distribute about 1 cup filling evenly on cake, spreading filling to very edge of cake and leveling surface. 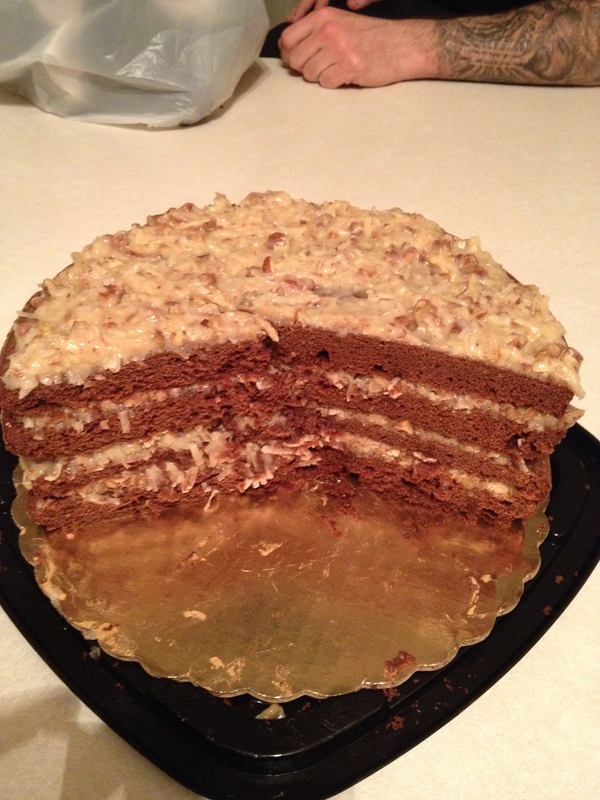 Carefully place upper cake layer on top of filling; repeat using remaining filling and cake layers. If necessary, dust crumbs off platter; serve or refrigerate cake, covered loosely with foil, up to 4 hours (if refrigerated longer than 2 hours, let cake stand at room temperature 15 to 20 minutes before serving). ENJOY!